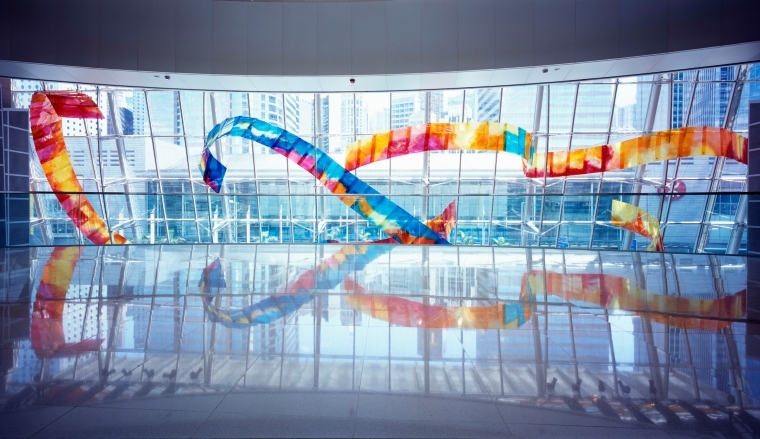 The use of dancing ribbons, flags and banners is a universal symbol used to greet visitors. It has a long history that crosses the boundaries of language, culture and geography. This is a modern interpretation of this concept, combining historical precedent with the most modern materials to create an abstract representation, in a dynamic and inspiring form. The sculpture is conceived to maximize its impact at all times of the day. By daylight the colors wash naturally across the space changing subtly with the movement of the sun. By evening internal lighting casts a night time glow. In all lights the color and detail are visually accessible to the viewer. The sculpture is intended to visually stimulate and delight the viewers from all perspectives. Greater levels of detail unfold and change as the viewer moves through the space changing distance and viewing angle. The project was carried out with a partnering artist, Shan Shan Sheng.